← How to convert OpenOffice documents of ODT to JNG? This article is to tell you three methods to use PDFcamp Printer Pro to print word to pdf basically, in batch and with the command line. To know more, please read the following paragraphs. No matter you use which way to process the task with PDFcamp Printer Pro, first, please click the following link to download it in your computer: http://www.verypdf.com/pdfcamp/pdfcamp_enterprise.exe, you can obtain PDFcamp Printer Pro, then double click the installer to install PDFcamp Printer Pro in your computer with the setup wizard. 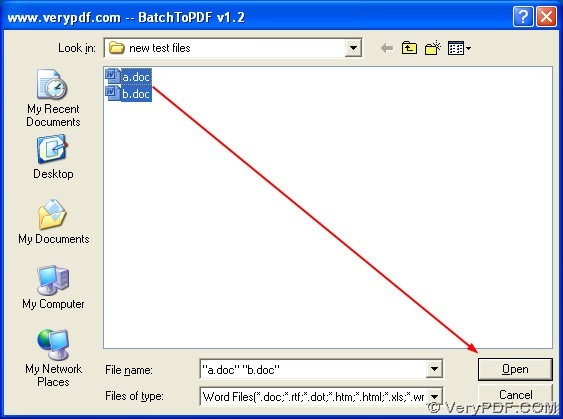 Then, please click “Open” on this interface, and a dialog box can be opened automatically, then please select the Word files you need to process one time, and click “Open” of the dialog box to convert word to pdf in batches, then the PDF files can be added into the original folder of the Word files automatically. The following pictures are about the selection of the PDF files and the new PDF files in the original folder. 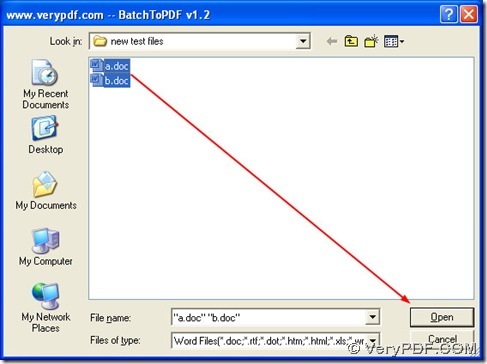 The program of “BatchPDF.exe” also support running in the CMD mode, which means you can convert word to pdf with the command lines one by one. To know more, please follow me in the next paragraphs. First, please open the command prompt window in your computer, for in Windows systems, the command prompt window is the running environment of the command line, to open it, please click “Windows+R” to input “cmd.exe” in the dialog box of “Run”, then click “ok” to launch it on your pc, then you will see the command prompt window can be opened automatically, where the current directory is as follow: C:\Documents and Settings\admin>. By now, three methods to convert word to pdf has been shown to you above, which are based on the virtual printer, the conversion of word to pdf in batch and the command line with PDFcamp Printer Pro. Any questions about PDFcamp Printer Pro, please click this link: http://verypdf.com/pdfcamp/pdfcamp.htm, and to purchase it online, please click this link: http://www.verypdf.com/order_pdfcamppro.html. How to convert DXF to PDF by command line program? How to print image to pdf with three ways? How can I print a PNG image to PDF file? How to set page margins in generated PDF files? This entry was posted in PDFcamp Printer and tagged command line, in batch, word to pdf. Bookmark the permalink.